An attic is a peculiar space, mostly due to its slant roof. It usually becomes a forgotten corner of the house where things are stored away, or at the most, a play corner or sometimes as a last resort sleeping space. Have you ever wondered why it cannot be elevated to a more prominent room? Maybe its time to give due credit to the humble attic. 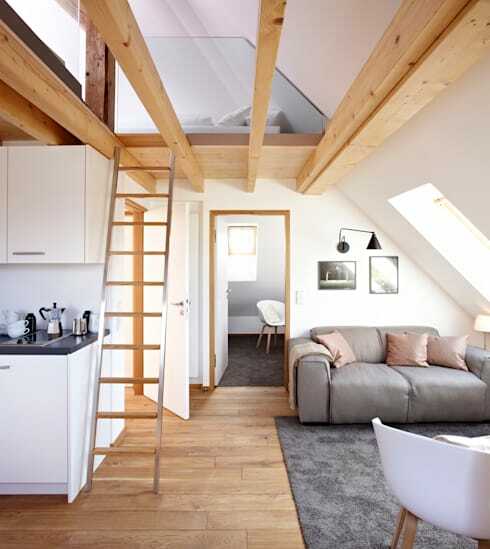 Explore with us these beautiful attics that are stunning, functional and practical at the same time. From additional library to a kitchen and even a full fledged bedroom, these attics will make to rediscover and look at your own attic in a whole new way. Tiny kitchens are a common place in city homes. With right planning and design, smaller spaces can be made very accommodating. 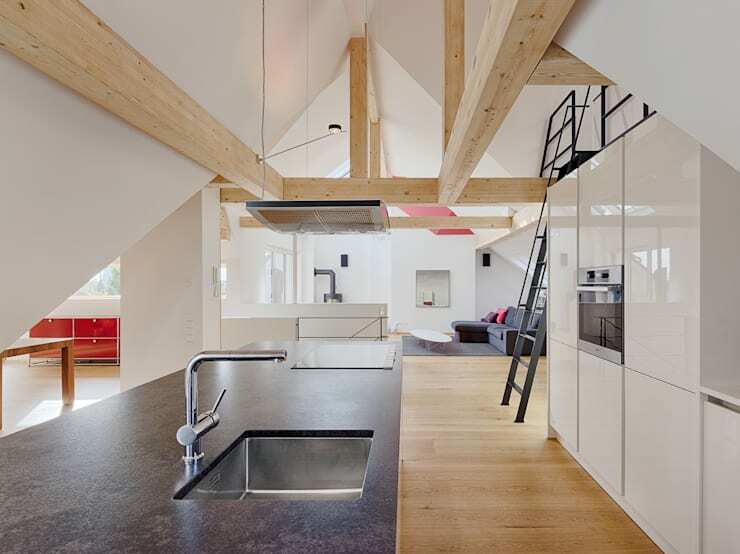 This modern kitchen under the roof is no less than any other in terms of style and decor. The sun roof on top makes for great natural lighting while windows add to the personality of the space. Its fascinating to see how the original structure of the attic has been retained and stuff has been added just to make it more functional without disturbing its raw appeal. The low ceiling means that hanger cabinets are difficult to install but semi high walls have been equipped with built in cupboards instead. Kitchen island or two add to even more work and storage space while the wood-clad roof gives a very cozy rustic feeling. You don't really need to go outdoors to spend a night under the stars. 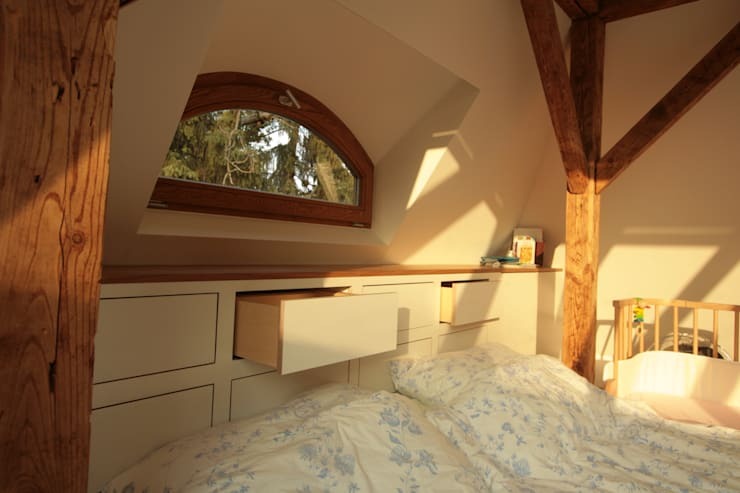 Convert the attic into a cozy little bedroom and the sunroof/ slant windows will offer you just that in the comfort of your home. Notice the minimal furnishing and mono-color theme allowing the small space to look bigger than it actually is. Using darker colors in the decor can make small areas look claustrophobic but the clever use of white allows the space to brighten up and more so with the the sunlight during the day. Use of insulation can help manage the heat inside on warmer days. An entire apartment has been created under this slanting roof. Sofa next to the window that allows in so much natural light is like God-sent in this tiny area. It not only brings a sense of openness, it also provides natural lighting and heating during colder months. The ladder takes visitors to the top floor which houses the cozy bedroom that's perfectly placed in a private corner. Again, just two or three neutral color tones help make the space look so elegant and classy in spite of its very limited area. 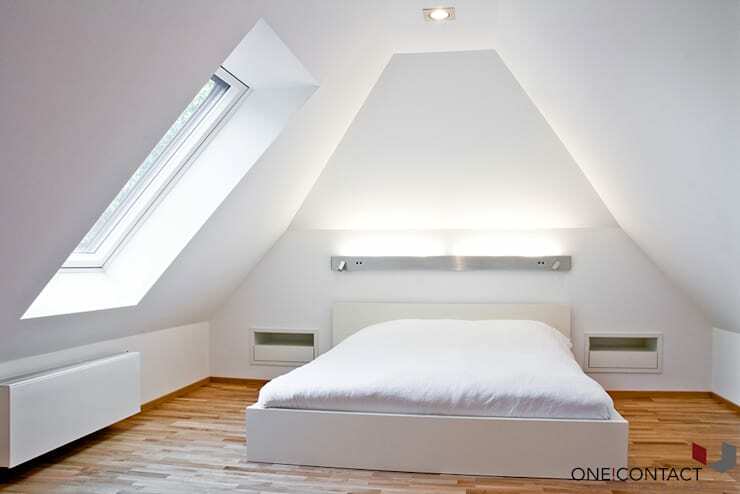 This is undoubtedly a fine attic conversion idea! Often wooden beams and pillars that support the entire house structure are the main reasons why attic space is not usable. However as you can see in this case, the other elements of this bedroom have been planned around the very same beams. All woodwork has been colored and polished to the same color tone to provide some sense of uniformity while the bed has been customized to a size that will fit perfectly between the pillars. The window offers a green foliage view outside apart from a source of incoming sunlight. Do you want to see the big picture? Take a look at this unique house in its entirety. Sometimes when working with old buildings, local rules and regulations can be really strict regarding what can and cannot be done to the building. 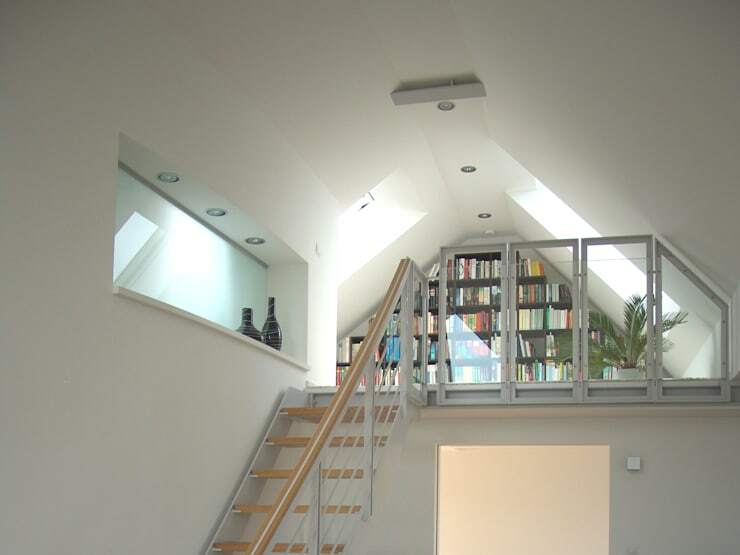 Not all attic conversion ideas may work in such cases. This apartment was originally an undeveloped roof store. The ceilings had to be completely removed and only very little remodeling was allowed. But the result is simply stunning combining the essence of the old structure and functionality and design of contemporary times. It is a case of a successful reconstruction with difficult old buildings and beautiful results. 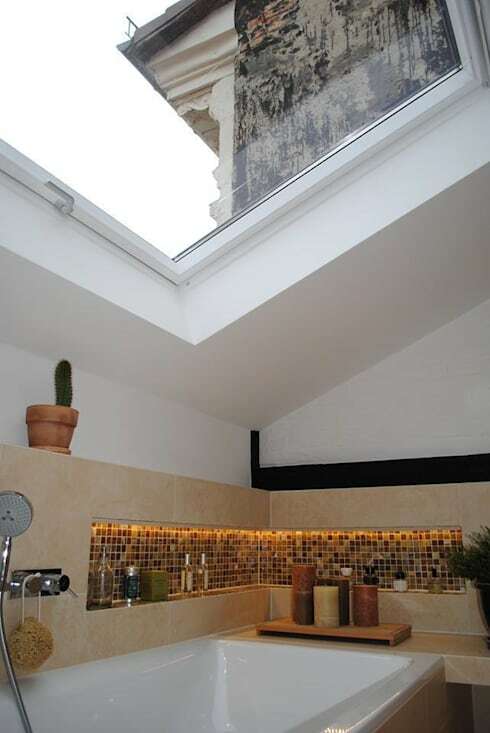 Think out of the box and you have this beautiful bathroom right in your attic. Consider this, it frees up space in the house below and offers a unique ambiance under a sunroof! A soothing hot tub with a natural view right above can add so much to the experience. It does require some structural and plumbing work before you can create a bathroom in the attic and also the surroundings outside need to be open for it to work. Also, make sure the window above is huge enough to offer views. For privacy, you may install another layer of translucent glass or blinds or even retractable glass when wish to open up the roof. Book lovers always look for more space for their prized possessions. A library in the attic checks all the boxes, it is secluded, cozy and offers lots of storage out of the prying eyes of non book lovers! Stack the books all over in neat cabinets and cupboards and if space allows, then a small chair or a cozy sofa to read endlessly is just what was needed to make a perfect place for a bookworm! 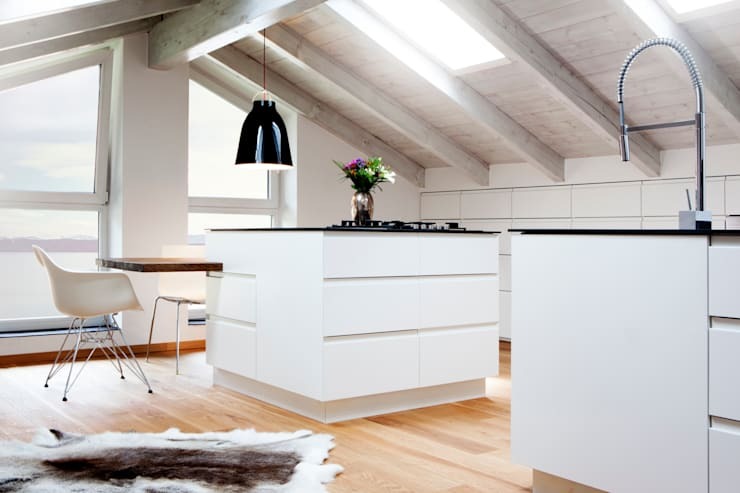 Again, the white color theme has been incorporated for its simplicity and giving a sense of more open spaces. Make sure the place is well lit, so either a window allowing sunlight in or reading lamps and ceiling lights. Regular cleaning and maintenance is really important too as books can get damaged due to even tiny seepage from the roof and walls and attics are prone to such incidents.